What is SentryOne Top SQL? Top SQL is a user interface that displays long-running and high-impact queries so you can easily troubleshoot SQL Server performance problems. With sortable grids, runtime charts, and index and statistics analysis, you can quickly determine root cause, prioritize issues, and move on to the next problem. Shouldn’t fixing bad SQL Server queries be easier? Want to know what was going on in your SQL Server environment while you were in a meeting, or even when you were sleeping? Was there one query that performed poorly? Was there a suspect statement that ran thousands of times in a short period of time? Tracing query history is difficult to do with built-in SQL Server tools like Management Studio (SSMS) or similar offerings. If you’re frustrated by the time it takes to find and fix poorly performing, high-impact queries, take a closer look at SentryOne. Our Top SQL capabilities make your life as a DBA or developer easier by helping you identify and diagnose query performance bottlenecks. Stop wasting time fixing query problems: With Top SQL, you can speed query troubleshooting so you can move on to more strategic initiatives. It’s no surprise that Top SQL is one of the most heavily utilized features in SentryOne: Monitoring and optimizing the queries executed against the SQL Server environment can have a profound impact on database performance. SentryOne Plan Explorer helps you get to the root of the toughest SQL Server query problems by displaying query stats and history. With Top SQL, you can list all T-SQL batches, stored procedures, and statement events collected for the current date range that exceeded the minimum specified duration or a certain percentage of memory (CPU) or disk IO. 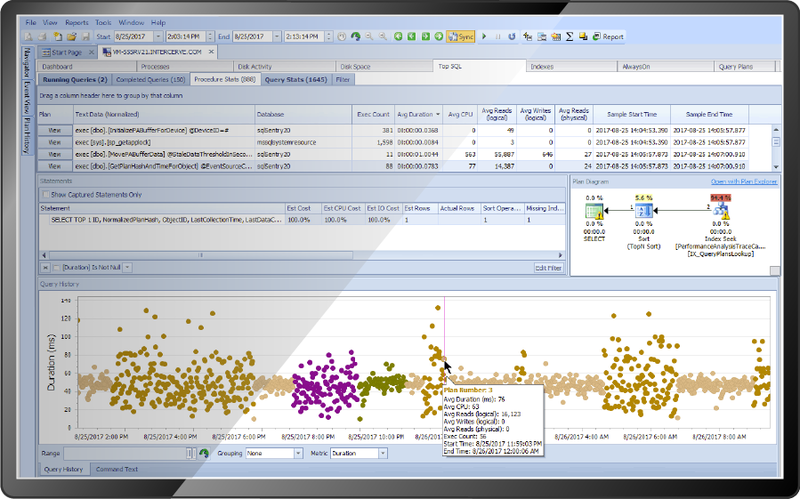 You can visualize your potentially troublesome queries within a specific time frame hourly, daily, or weekly, and see whether any of your filtered database queries show suspicious behavior. By drilling down on your query history, you can see the query duration, CPU consumption of each query; the number of Reads and Writes performed, and more. 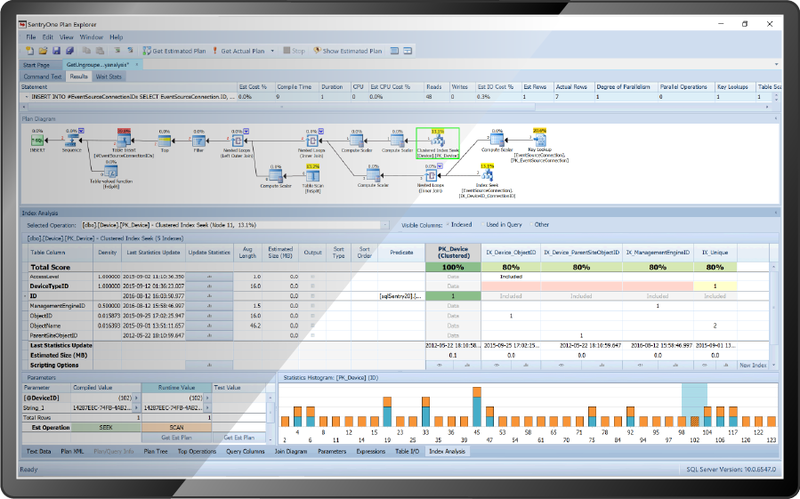 You can even take a quick look on your screen at the query plan behind your query or procedure, and open, analyze, and modify that plan with SentryOne Plan Explorer, a powerful feature that is built into the SentryOne Monitoring Platform and is also available as a free, standalone product. Want to start analyzing your high-impact SQL queries?